Combine water, salt, soy sauce, and wasabi in a small bowl. Take one strip of nori and brush the liquid over the entire sheet. Once wet, lay another piece of nori on top and press down so the sheets stick together. Cut sheet in half, then cut each half into 6 strips. Repeat with remaining nori. Place strips on baking pan. Bake at 250 degrees for 20 minutes until moisture is gone. Transfer to wire rack to cool. Seaweed is a very unique flavor, but very Japanese. While the most popular way to enjoy seaweed with sushi, there are many other uses that can be just as delicious, such as sprinkled on top of rice, simmered in miso soup, or wrapped around a delicious onigiri. I personally cannot get enough of Japanese trail mix. The wasabi peas, the soy sauce drizzled rice crackers, and don’t forget the delicious nori wrapped crackers mixed in! Those sushi shaped chips are always the first to go from my bag, so I wanted to find a way to enjoy the seaweed on its own. Seaweed itself is very nutritious, so for those of you trying to watch what you eat, these are a great addition to your diet! 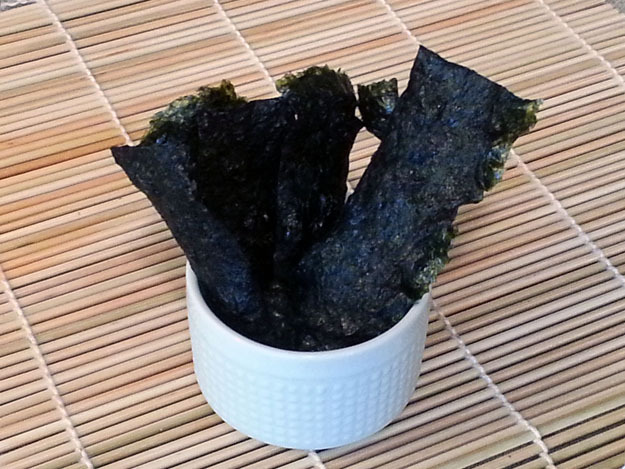 Nori sheets are low in calories, (each sheet is about 8 calories) and they have fiber, vitamins, and minerals, so if you’re looking for a great healthy snack, next time skip the potatoes and go straight for these low calorie nori chips! To give these chips extra thickness, I’ve layered 2 pieces of nori on top of each other. If you want your chips to be really thin, you can just brush the mixture on to one sheet instead. – Preheat oven to 250° Fahrenheit. Combine water, salt, soy sauce, and wasabi in a small bowl. 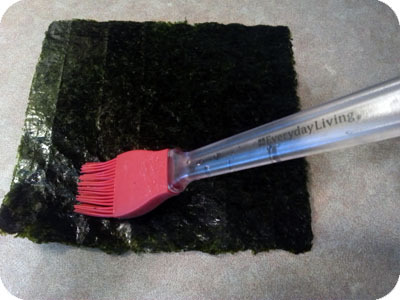 Take one strip of nori and brush the liquid over the entire sheet. 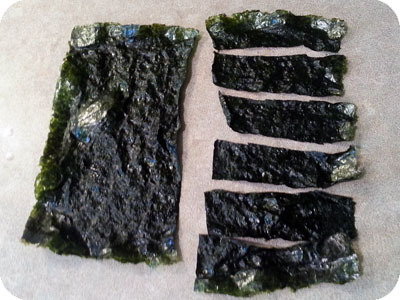 – Once wet, lay another piece of nori on top and press down so the sheets stick together. Cut sheet in half, then cut each half into 6 strips. Repeat process with remaining nori. – Place strips on a baking sheet in a single layer. Strips can be close together, but if they are touching they may be stuck together when finished baking. Bake for 20 minutes until moisture is completely gone and strips are crunchy. Transfer to wire rack to cool. what temperature to bake the seaweed?